Seen quite a few threads on internet at various forum on the new sony digital cam, many seems to be china site or HK site. any of the experts here have any thing to share? not familiar with NEX system. I see people using NEX adaptor. How come aps-c adaptor can be used for full frame? A7R - As mentioned by Sony, the 36mp sensor on A7R had been designed specifically for lenses with shorter back focus distance. These include shift microlenses arrangement to reduce the effect of vignetting, thinner sensor filter by removing the AA filter layer etc. However, we should be aware that the pixel density of 36mp is really no kidding, for which the demand on the MTF performance is ultra-high! This had been proven in the situation of Nikon D800E already. For the symmetrical wide angle designs like the Biogon or Super Angulon, the distortion had been corrected to extremely low level, but with the trade off on the vignetting performance as well as border resolution. This had been proven already in days of film (e.g. the test of G Biogon 21/2.8 vs CY "Apo" Distagon 21/2.8 ) but with the characteristic of digital sensor the effect is simply magnified now! Now I remember u have probably showed us this article before, but my memory getting worse now adays. Should be getting my pre-ordered A7r today evening. Tested the A7r with ZM 15/2.8, 21/2.8, 25/2.8, 28/2.8, 50/2 and 85/2. No time to look at the jpg/raw on computer in detail yet. But it is clear there are colour shift for the wide angles. Depending on shooting conditions, some case the jpg are still good to go. But for scenary shots looks like I need to go back to CY/QBM 18/4 espically those scene with bright sky and water. Disappointed that the ZM 15/2.8 scenary shots cannot be used without some editing. Any experts here have already develope a good work flow to go around this? have been playing the a7r for about 2 weeks. Now in Malaysia KL with the a7r. Quite comfortable with this body already and has got most of the customised functions set up. Had tested with most of my ZM lenses except the ZM 35/2. Actually the images for the 21/2.8, 25/2.8 and 28/2.8 are usable and I began to think that the edge issue is probably light fall off than colour shift and smearing. I am first time seriously dealing with digital sensor and feel that digital sensor is so much more demanding for focusing than film. Even with wide angles I can see the focus sharpness difference between mid range and far object. 2. can mount all my ZM, Praktica, QBM, CY lenses with just one body. So far the only issue is flash photography, where if the existing light setting too far off I cannot do framing in working aperture. I suggest that you should consider the vertical grip as well which provide much better handling with the heavy lenses. Dear Mr Wah, already bought the grip. A fantastic grip. though expensive, but is dusts and splash proof, with a shutter release, one preset button and a AEL button! Just found out that the A7 grip can accommodate 2 batteries, it only uses the 2nd one when the first one is totally drained. But however, the grip works with just one battery! CY lens system finally alive again! Finally I am serious with digital camera. Have been taking photos with Kodak negatives since 1985, and for some reasons I am waiting for a full frame digital, specifically, with an affordable price. And so Dec 2013 I pre-ordered and got an Alpha 7R. 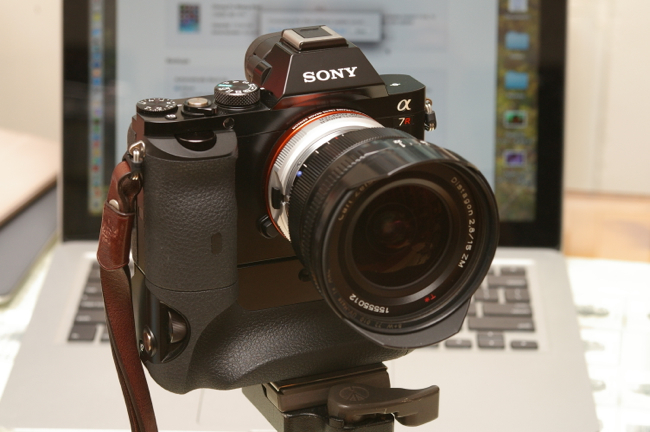 Alpha 7R with the vertical grip and the not so compatible ZM 15/2.8 Distagon T*. I ordered all the mount convertors I need, including Praktica-E, Rollei QBM-E, Contax CY-E, Leica M-E and Nikon-E. All of a sudden I have a digital body (actually I have and still have a 6 MP Pentax DL but never use it for any serious work) and so many lenses now to used with. I only use the Alpha 7R in one mode: manual exposure with focus magnifier. And I am very please with the camera. P Ubin Singapore, f5.6 1/125 ZM 25/2.8 Biogon T*, ISO 100, 1 Dec 2013. Or this one taken by the ZM 28/2.8 Biogon T*, note the high centre details. f4 1/125 ZM 28/2.8 Biogon T*, ISO 400, 10 Dec 2013. The ZM 15/2.8 Distagon, despite a Distagon design, the rear of the lens is still too close to the full frame digital sensor and thus the corner light rays attack angle is still too steep. However, in certain situation the photographs taken were totally usable, like the shop display below. In fact a close up examination of the lights at the corners there are little colour fringing and image issues. f4 1/60 ZM 15/2.8 Distagon T*, ISO 800, 24 Dec 2013. A more suitable 15mm would be the Zeiss 15/2.8 ZF.2 but I do not really like the size of it.